Sketch, Twenty-Six and Nurture by Smart Bottoms in stock! Meet Smart Bottoms NEW Prints, Sketch, Twenty-Six & Nurture! Smart Bottoms Introduces Sketch, Twenty-Six and Nuture, a NEW Print Collection! 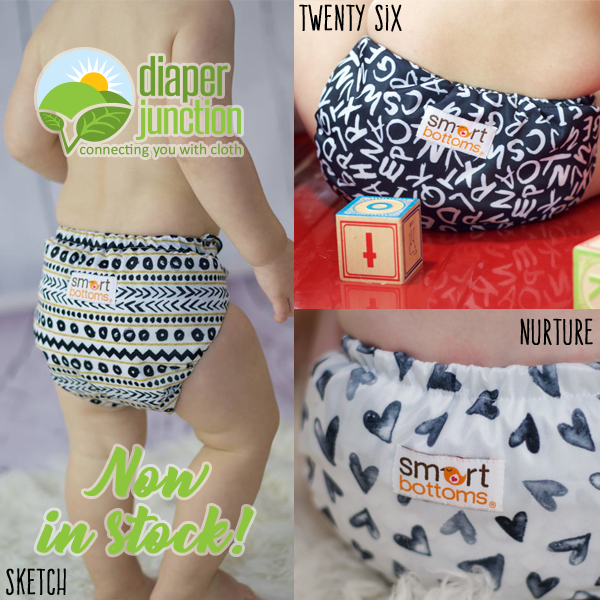 Have you seen Smart Bottoms newest cloth diaper and accessory prints? Sketch, Nurture and Twenty-Six are a part of their new Building Blocks of Creativity Collection and in stock now at Diaper Junction! Creative NEW Prints in Dream Diapers and 3.1 OS AIO's! On January 6, 2017 Diaper Junction stocked the NEW Building Blocks of Creativity Collection from Smart Bottoms in both the Dream Diaper and Smart One 3.1. Both popular Smart Bottoms cloth diaper styles are available in Sketch, Nurture and Twenty-Six. Each stylish print nicely compliments the others in the collection and we're sure cloth diapering families will adopt the "collect them all!" mentality when it comes to these adorable new prints for their cloth diaper collection. Both the Dream Diaper and Smart One boast a customizable fit, adjustable snap down rise, buttery soft natural fiber interior and top-notch cloth diaper absorbency. What are the main differences between the Dream Diaper and Smart One? The NEW Smart Bottoms Dream Diaper features a snap in soaker vs. a sewn in one which means inserts are interchangeable for overnight and daytime, and the Dream Diaper also features a hidden pocket opening giving you the best of both worlds. The pocket opening can be used to add a tri-folded prefold, micro or hemp insert or other absorbent doubler of your choice to increase absorbency based upon your child's needs. Sensitive to synthetics? Use the pocket to hid your synthetic insert keeping a natural fiber layer between it and your child's skin. Ready to shop for the Dream Diaper or Smart One in the new 'Building Blocks of Creativity' prints? Click HERE to shop our Smart Bottoms selection and keep in mind that we ship FREE in the USA on all orders over $25 + ALL orders receive 10% back in Reward Points!